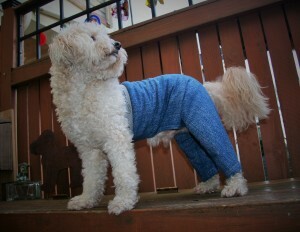 The challenge of hot spots, our dog pants can help! – Mozzie Pants, Pants for dogs and dog suspenders! Dog hot spots are such a challenge for some pups. Our boy Cody has seasonal allergies and for a few months a year hot spots are a challenge. Historically during this time for Cody we would be forced to do antibiotics or steroids to keep the hot spots under control. The side effects from these meds concerned me and I wanted a better solution for Cody. The dog cone of shame was not an option for our sensitive Cody, he would become depressed as soon as it was put on him. This is why I designed the Mozzie Walking Pants and T-shirts. They are made from a very comfortable light weight cotton and cover the wounds. It was amazing how great they worked, once the areas were covered with the garments Cody would leave the areas alone!! Now when the season starts and we see him starting the licking and chewing of his skin, on go his Mozzie Pants and issue solved. Since we have started using Mozzie dog pants on him we have not had to give any medications!! Home harmony for our home and pups accomplished! !